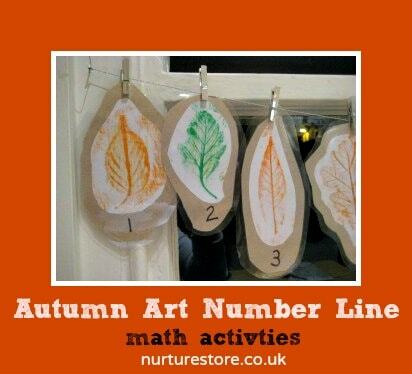 Turn the classic autumn craft of leaf rubbings into a useful math display by making a leaf number line. A well stocked craft box – what’s in yours? 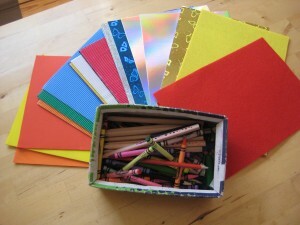 Nurturing creativity in your children requires a constant supply of craft materials! Here are some ideas on what’s easy, cheap and useful to have to hand. Get recycling – start a collection of empty cereal packets, used wrapping paper, old Christmas and birthday cards, toilet rolls tubes, egg boxes, celophane wrappers from boxes of chocolates, tissue paper from inside shoe boxes, empty food packets / boxes -especially ones that are an unusual shape – all free and environmetally friendly. What other ideas? Please post a comment – I’d love to hear your suggestions. Tell grandparents etc. you’re collecting – and ask them to let you have any goodies they come across. Stock up in the sales – it almost goes without saying that you’ll save lots of money if you bulk buy when things are discounted. 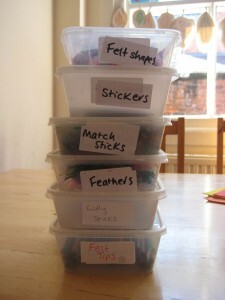 Make a craft box – we use a big cardbard box in the utility room to store boxes / packets etc. and we have a shelf in the playroom for paper /pens / glue sticks and so on. This allows the children to access the materials independently and gives them the freedom to select their own resources – they’ll have lots of ideas you’d never think of to make use of what’s available. (I keep paint / PVA glue on a higher shelf so we can make sure table cloths and aprons are on before we use these). All sorts of paper – white and coloured, A4/A3 / on a roll, sugar paper, tracing / greaseproof paper, tin foil, tissue paper, corrogated card, holographic card, wallpaper, wrapping paper – you can never have too much paper! Collage materials to spark the imagination – feathers, pine cones, dry leaves, felt, wool, cotton wool balls, drinking straws, envelopes, matchsticks, lolly stiks, pipe cleaners, stickers (bulk packs of stars / dots are usually a lot cheaper then character stickers). Re-cycle the containers your take-aways arrive in to keep all these organised! Something to stick with – PVA glue is good for model making, and you might want some fabric glue, but for general use I find glue sticks are really easy (and not too messy) for the chidlren to use independently. You can use spatulas and cotton buds for spreading. Tubes of glitter glue are fun and children love them (watch out for pots of loose glitter though as some can be abrasive and children will get it all over their hands – and possibly in their eyes). Investing a little money on a sturdy stickytape dispenser has proved a good expense as the children can use it by themselves. Imagination – sometimes you’ll be working with the children to create a specific thing but mostly let them have free reign with the materials, to choose what they use and how they use it. Allow them to use the craft resources in all their play – so they can use matchsticks with play dough, or cottonwool balls in their dumper truck. Nurture this experimentation and imagination. You never know when the creative urge will strike – so get your craft box ready! 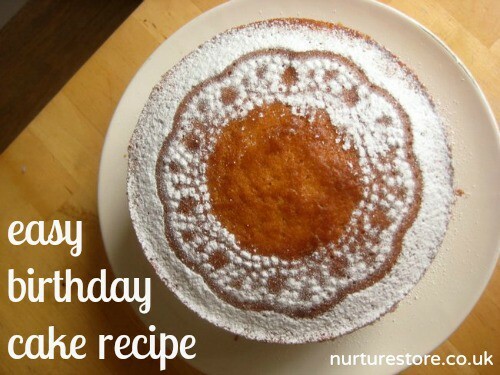 Birthday Cake Recipe – best ever! 1. Grease the two cake tins with butter – on the bottom and all round the sides. Pre-heat the oven to gas 4 / 180 C.
2. Cream the butter and sugar with a wooden spoon. 3. Add the eggs one at a time and beat with an electric whisk until smooth and stiff. 4. 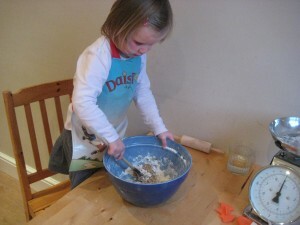 Sieve in the flour and fold it in gently with a large metal spoon. Easy does it. 5. Mix in a little milk to get the mixture to a soft consistency which drops easily off the spoon. 6. Divide the mixture evenly between the two tins. Family tradition says everyone present in the kitchen has to blow the cake a kiss to make it taste good. 7. Bake for 20 minutes until it’s firm to the touch on top when y0u press it gently. 8. Turn the cakes out on to a cooling rack. 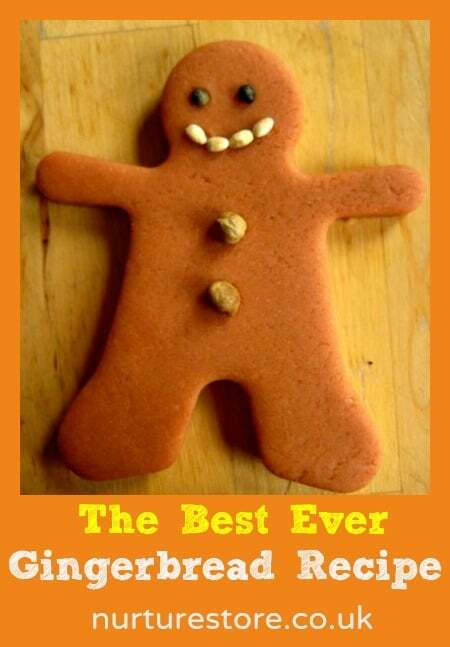 Once completely cool you can decorate (see icing receipe below). 2. Sieve in the icing sugar and beat with the butter. 3. Add a little water (or orange / lemon juice for flavour) til you get the consistency you want – fairly stiff, but spreadable. Less is definitely more – don’t add too much water. You could add a few drops of food colouring if you want. 4. Spread over the top (and sides if you want) of the cake. Then add your decorations. Tinny pop music at full volume, fifteen shrieking children charging round until they hit dehydrated, sensory -overloaded exhaustion and a party bag filled with bits of imported plastic that will be broken, swallowed or lost before you even get home – welcome to play-barn party hell. 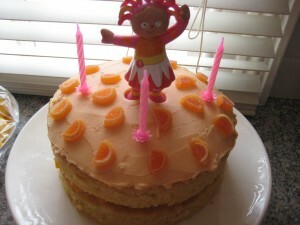 There is another way – a traditional at home birthday tea party – just like you had when you were young. With a tiny bit of forward planning you can create a happy, relaxed and enjoyable (for all) party your child will remember for years to come. Why chose a traditional party? it continues rituals established in your own childhood and allows you to observe family traditions. These rituals nurture a child’s sense of belonging within a family and a culture and make them feel special when it’s their turn to be at the centre of a shared celebration. it’s more personal as you can tailor the party just how you and your family like it. It’s also special to welcome friends and family into your home and serve food you have prepared yourself. I think this honours those who are invited and shows appreciation of the role they play in your child’s life. it’s a lot cheaper. Whatever your budget you can afford a party at home. 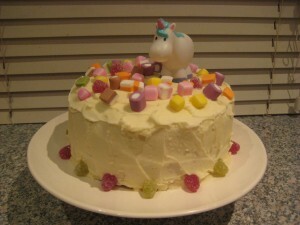 It’s very inexpensive to bake a cake and no money needs to be spent at all playing games the children will enjoy. In today’s consumerist society we should perhaps question spending £100 plus on a play-barn party and consider the impact on the child who grows accustomed to having so much money lavished on them. it’s a lot more enjoyable! With a little forward planning you will have a smooth running party which includes just the activities your young guests enjoy, and which doesn’t leave them tired or overwhelmed. 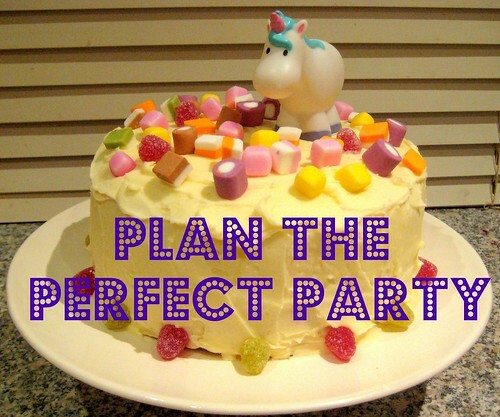 So what are the essential ingredients of a traditional birthday party? Pick a theme – let the birthday girl / boy choose whatever they like best to make the party special for them. In our family we’ve had pink, orange, mermaid and unicorn parties recently. You can use the theme to guide the choice of decorations, food and games but keep it really simple – have a look at the tips below for more ideas. Bake a cake – the centre piece for every great birthday party is an eye catching cake with the appropriate number of candles. 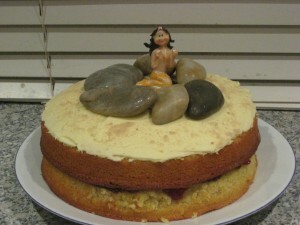 Now, there are many, many things I am no good at, but I do make exceedingly good cakes. A simple sponge cake is very easy to make – especially if you follow my family recipe. Decorate the cake in a way that reflects the party theme. I’m not very good at icing so you’ll see from the pictures here that I use toys / figures instead – very effective and very easy. Prepare the food – stick with the same basic menu for each party, with a few additions to carry through the theme. For the basics go for ham and cheese sandwiches, a bowl of cherry tomatoes and cucumber slices, a bowl of grapes, a bowl of crisps (hoops being the crisp of choice for us), gingerbread biscuits cut out in the number of the child’s age and a jelly. For our mermaid party we made gingerbread in the shape of fish. For the orange party we served satsumas instead of grapes and had orange jelly. For a racing car party you might make car shaped sandwiches. I find it useful to agree in advance with the birthday girl/boy who is going to sit where around the tea table and we make little place-cards with each child’s name on and a picture of a fish, racing car, whatever drawn on – as I find this avoids any squabbles about who gets to sit next to the guest of honour. Add some decorations – but again, less is more. We have some balloons tied to the gate outside and bunting hung around the room. You can paint your own triangles of paper for bunting or use cut up wallpaper / wrapping paper stapled onto parcel ribbon – very quick to assemble and can be saved for another occasion too. Chose colors to match your theme. Organise some activities – 1. Have an opening activity the guests can join in at stages as each arrives – which keeps everyone entertained while waiting for everyone to arrive. 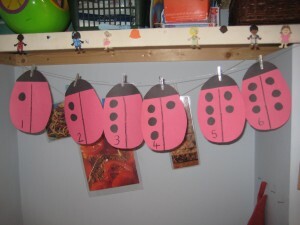 A craft activity, linked to your theme, is good here. We have made shell bracelets, decorated magic wands and made musical shakers at previous parties. 2. Include some lively games – to get the party going! Musical bumps, statues and circle songs work well. Have a goody bag of sweets for the children who are ‘out’ to pick from to avoid any upset, and a bar of chocolate as a prize for the winner. 3. Have some calm activities – for when everyone is getting a little too giddy, to give them time to digest the party tea and to calm them ready for home time. Pass the parcel is the classic, but pin the tail on the donkey/ horn on the unicorn/ wheel on the racing car is an alternative. We’ve had fun with ‘guess what’s in the sock’ (see link) and the memory game . A story is a very nice way to round things off too, and can of course link to your theme. Party bags – I think it is usual nowadays to give the guests a goody bag to take home, but I would streamline the contents: a piece of the birthday cake, a packet of sweets / bar of chocolate and a small gift related to the theme (hair clips or stickers perhaps). 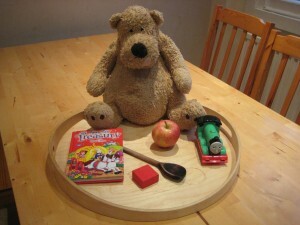 And the children can also take home anything they made in a craft activity.